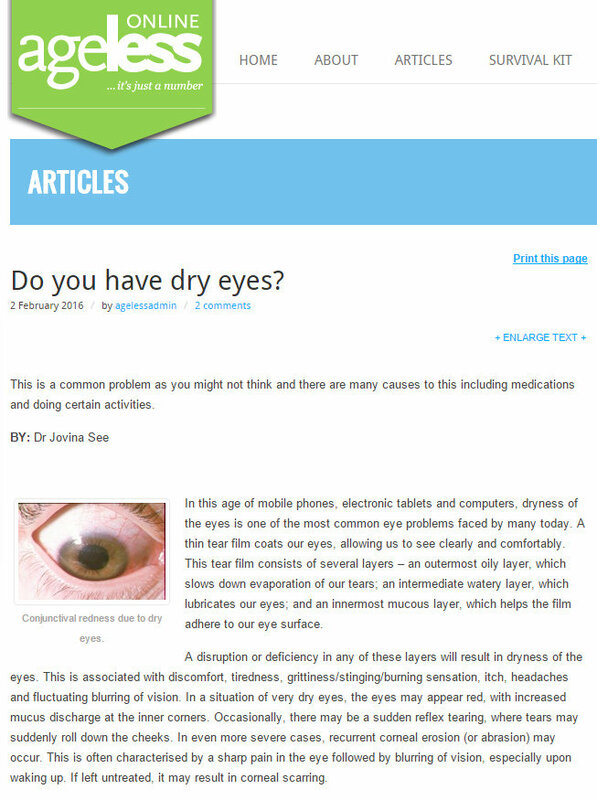 Learn about the various causes of dry eyes and also the treatment methods in this online article by Dr Jovina See. Here is the link: Treatment of Dry Eyes. (1) Dehydration – This can result in dry eyes. This could be simply due to drinking inadequate amounts of water, especially after excessive perspiration or drinking alcohol. (2) Certain activities – Prolonged computer usage, reading, watching TV or travelling on an airplane can also exacerbate dry eyes. Our blink rate decreases to as little as a third of the normal rate during such activities, and results in less tear production. Engaging in such activities in a cold air-conditioned room or with the electric fan blowing directly into our eyes can further worsen the problem. (3) Contact lenses – Wearing contact lens over many years can lead to de-sensitisation of the cornea and result in reduced tear production. Hence, wearers are more prone to developing dry eye symptoms from a younger age. (4) Smokers – Smoking has also been associated with an increased incidence of dry eyes. In fact, it has been reported that smokers are twice as likely to have dry eye symptoms compared to non-smokers. Even exposure to secondhand smoke can alter the tear film and lead to dryness of the eyes. (5) Age – This is also another factor, and dryness worsens, as we get older. Due to changes in our hormonal balance as we age, there is a gradual decrease in the amount of tear production starting from about the age of 40 and is more pronounced in women who are peri-menopausal. (6) Medicines – Medications such as isotretinoin used in the treatment of acne, antihistamines and decongestants used for runny nose and allergies, and some medicines used to treat high blood pressure are associated with increased dry eyes. Some antidepressants and hormone replacement therapy can also cause dry eyes.